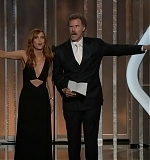 For the second Golden Globe update I have added tons of high-definition screen captures of Kristen Wiig’s TV appearances throughout the show. 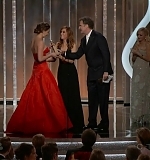 Including the presentation of Best Comedy Actress with Will Ferrell and various audience-shots. Even more coverage coming up in a few!